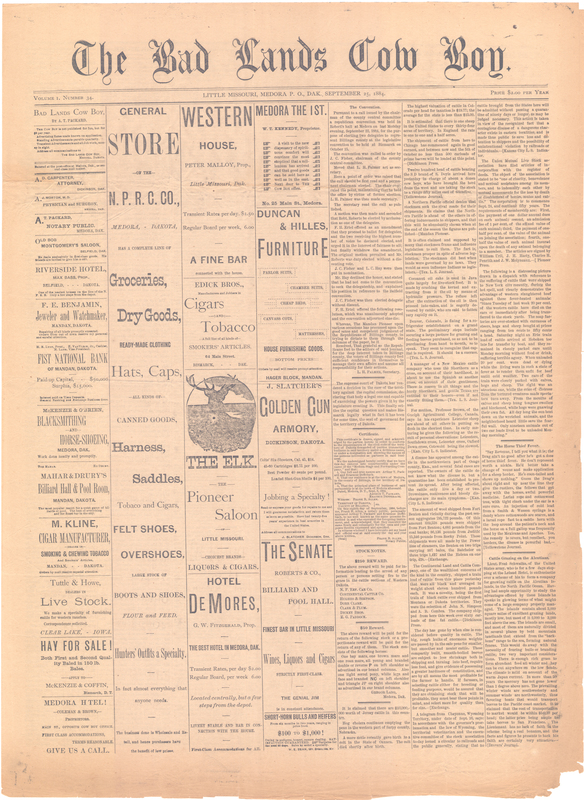 In early 1884, crime was an appalling problem in Medora. Theodore Roosevelt had not yet become sufficiently entrenched to exert any political muscle in the Badlands, and the Marquis seemed to accept most of the wild goings-ons as a fact of life in the west. It was left to A.T Packard, owner of The Badlands Cow Boy, to champion the cause of law and order. When an effort to organize Billings County went down in defeat, leaving the outlaw majority free to ride roughshod over whomever they pleased, Packard called for a “mass meeting” to try to curb the lawlessness. At this meeting Packard was declared the first chief of police of the city of Medora, a position he took very seriously. A.T. Packard was one of the few men in town who did not carry a gun. Packard strongly believed that carrying guns only caused more problems. He led by example, and he tried hard to convince others to do the same. When Packard suggested to Roosevelt that he should check his firearms at The Badlands Cow Boy office whenever he was in Medora, Roosevelt protested. Roosevelt was greatly enamored of his frontier attire, and the guns were an important part of the ensemble. He didn’t want to give them up. Packard patiently explained that if he ever got into an argument with a real gunslinger, things would no doubt end very badly. Roosevelt was not convinced. He was confident he could take care of himself. Packard called over a local pistolero named “Two Gun Billy Roberts.” Packard explained to Roosevelt that Billy Roberts could hit just about anything when shooting with his right hand. Then he explained that Billy was ambidextrous and could shoot equally well with his left. He further explained that Billy could shoot with both hands at the same time. Roosevelt was unimpressed. Eventually, Packard fetched a couple of tin cans. He stood on Billy’s right. Roosevelt stood to Billy’s left. They threw the cans into the air as high as they could. Billy whipped his pistols out of their holsters and blew both cans out of the sky. Then, when they came back to earth, he fired several more shots and kept both cans rolling over the ground, each on its own wildly erratic path. When it was all over, both cans were riddled with holes. It was an impressive exhibition. Roosevelt got the message. He checked his guns. This story was excerpted from Rolf Sletten’s book, “Medora – Boom, Bust, and Resurrection.” It can be purchased on our website.